The 9ff Porsche 977 Turbo. Sweet Baby Jesus. God I love German engineering and what they do to motor cars. 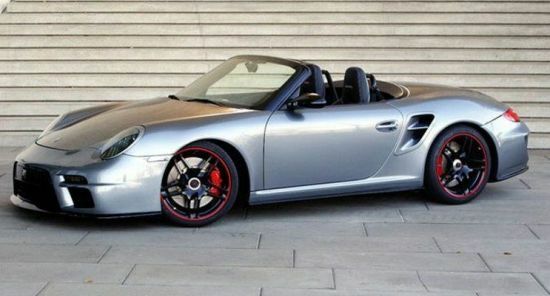 This year Porsche is introducing the Boxster Spyder, a true sports car version of the iconic Boxster. No radio, no AC, no cup holder, just a pure driving experience. They have lightened the car by by more than 500 pounds and bumped the HP by 10 over the Boxster S, all while increasing the ever important maximum torque ratio. It looks absolutely beautiful, and is actually priced within the reach of many, but that is not what this post is about. This post is about the Autobahn burning modded Porsche 977 from those crazy Germans at 9ff. 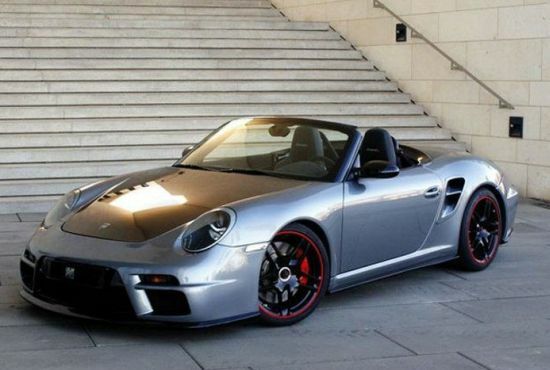 Inspired by a series of older Porsche convertibles, especially the amazing Porsche 997 Turbo Cabriolet, a group of engineers at the German firm “9ff”, have designed a more defined version of the 977 with updated ground effects including enhanced front and rear bumpers, deeper sideskirts and a larger rear panel that completely hides the soft top. 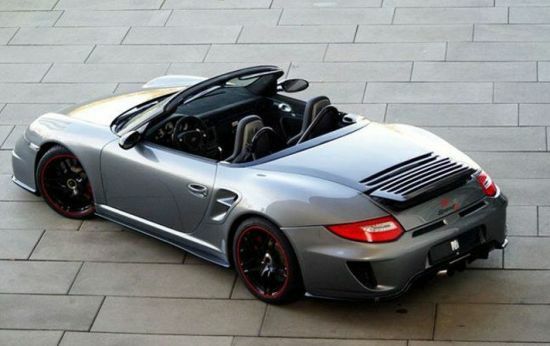 9ff has entitled their creation the “Speed9 Porsche 997 Turbo,” this new version Porsche convertible like most other speedsters (including the Boxster Spyder) features a lower windscreen with a more raked camber. The car is running on a twin-turbo flat-six cylinder generating an amazing 650 horsepower. It comes integrated with a pair of 9ff F650 VTG turbochargers, a sports catalytic converter, tuned stainless steel exhaust, sports air filter and reprogrammed ECU. The brakes are made up of 380mm carbon discs with 6-piston calipers for as much stopping power as get up and go. 9ff modifies the chassis to integrate adjustable stabilizers at the axle (both front and rear), double springs and four aluminum spring plates, allowing better control at high speeds. Speeds which I’m sure someone will be hitting between Munich and Berlin in the near future. Christmas is coming, so which one of you is going to buy me a present? Posted in Automobiles and tagged 9ff Porsche, Autobahn, German Engineering, Germany, Going real fast, Porsche 977, Porsche Bosxter Spyder, Porsche Boxster, Sports Car, Sports cars on November 24, 2009 by Author.